First we begin with Job. What we heard today was only a small part of Job’s whole story, a story that unfortunately you won’t hear in its entirety at Sunday Mass. And it’s important for us to understand Job’s hopelessness in light of his whole story, so for those of you who haven’t read Job, sorry but I’m going to spoil it for you. However, I encourage you to read Job on your own sometime, it’s a fascinating book. [pause] Scripture tells us that Job was a man “who was blameless and upright, one who feared God, and turned away from evil.” (Job 1:1). Job was an upright man and yet, when we read the story, we see that God allowed Satan to afflict Job with suffering to try to get him to blaspheme God, which Job does not ever do. Satan afflicts Job by destroying all of his property, his servants, and killing his sons and daughters. Satan additionally afflicts Job physically with sores that covered his whole body and through all of this “Job did not sin or charge God with wrong.” (Job 1:22, 2:10). The story unfolds as a series of speeches given by Job and his friends as they try to understand why God is seemingly punishing Job. This is where we find Job today, despairing and about to lose hope. But as we see the story unfold, God himself enters the dialogue with Job and reminds him that it is not Job’s place to understand God’s ways. God created the universe, not Job and Job is not meant to fully understand it. Job’s suffering, even though he was an upright man, fall into this realm of mystery; it is God’s way, not his way. Job finally realizes this and humbly bows in reverence before God (Job 42:6). The concluding narrative reveals that Job’s life is reversed, God rewards Job by removing his suffering completely. Job receives twice the amount of fortunes he had before and God blesses him with 7 sons and 3 daughters. So how, you might ask, does Job’s story relate to us? Well, his story IS our story too. That is where the psalm and the Gospel weave Job into our bigger story. Job himself suffered greatly, but at the end of the day God rewarded his humility, faith, and prayer by removing his suffering and blessing him. Jesus wants to do the same thing for us today, amidst our own sufferings, whatever they might be. The Lord is the one who heals the brokenhearted, the wounded, those who suffer as we prayed so beautifully in the psalm. Jesus wants to heal us! Job’s story ends with his healing and blessing by God, but the Gospel reveals that there is more to the story than that for us. In the Gospel there are four different movements that show this to us. Simon’s mother-in-law responds in service. The disciples bring the whole town to Jesus to be healed. Jesus goes throughout all of Galilee preaching and driving out demons. Firstly, we see that Jesus himself is moved by the suffering he sees around him and immediately when he learns that Simon’s mother-in-law is sick with a fever he grasps her hand and heals her. He desires to heal her, as he also desires to heal us. This leads directly into the second movement: Simon’s mother-in-law responds to Jesus’ healing by serving them; in other words she responds in discipleship, which is the Christian response to Jesus’ healing in our lives. What I find incredibly interesting is in the original language that the bible was written in, Greek, the word used to describe her response to Jesus’ healing is “διακονέι”, which comes from the Greek verb “διακονέω”, which literally means “to serve.” This is the same Greek word that the English word “deacon” comes from, which is incredibly personal for me because this is the same radical discipleship I now live out through my ordination to the diaconate, which many of you were present for. 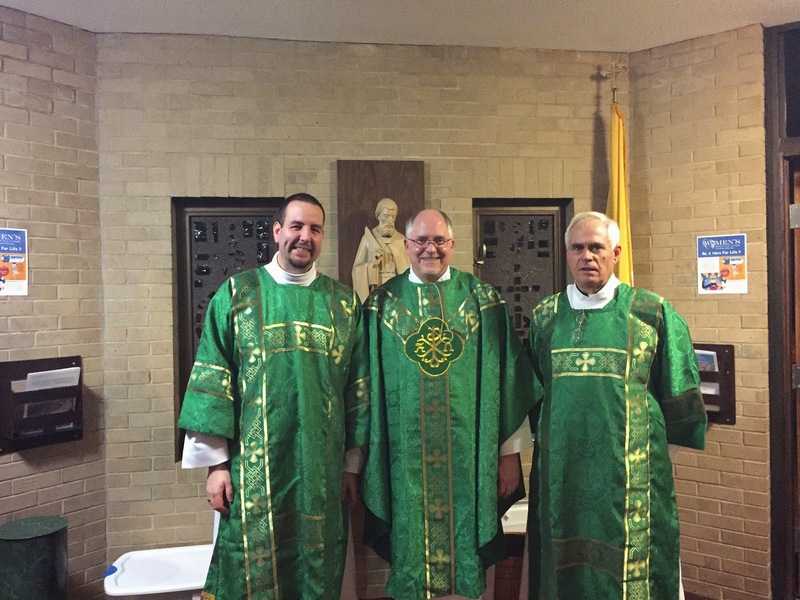 And I, like Simon’s mother-in-law have experienced Jesus’ healing in my own life; I have experienced God’s healing through prayer and the sacraments, especially through the sacrament of reconciliation, and I am responding to God by laying down my life in discipleship, as a deacon and as a future priest. This is the same response of service that Simon’s mother-in-law had. And so we move on, then, to the third movement in the Gospel. The whole town was brought to Jesus to be healed and Mark tells us that Jesus “cured many who were sick with various diseases, and he drove out many demons.” (Mk 1:34). Jesus didn’t just want to heal Simon’s mother-in-law but he wants to heal all those in the town who were also sick. Jesus’ healing is not limited; he healed the whole town in addition to Simon’s mother-in-law. This outward attitude of Jesus flows into the fourth movement in the Gospel, Jesus wants to go out to all of Galilee to preach, heal, and drive out demons, which he does; Jesus wants to heal the whole world. And Jesus ultimately does this because in his death on the cross he brings all of us, not just all of Galilee, but all of humanity, fully back into relationship with God, our heavenly Father. This is the ultimate healing of sinful humanity, administered by Jesus; He takes on sin itself for us in order to heal us and to redeem us. He suffers the punishment of sin, which is Death, for us. This is a punishment we all deserve because of our sinfulness but Jesus takes on this punishment for us so that we do not have to. This is at the core of why Jesus became man. His life and death accomplishes our salvation. Through Jesus each and every one of our souls is restored to a personal relationship with God. And very often we take this crucial truth for granted and think it’s this just a nice thing that Jesus does but doesn’t affect us personally. But if we really take to heart that Jesus heals us spiritually, it should draw out of us a response of supreme gratitude and love, the same response that Simon’s mother-in-law had, discipleship. And this can mean being a deacon or a priest, like myself or Fr. Cliff, or also being a religious sister, like Sr. Carol. But it can also mean being a good and loving father or mother to a beautiful family. It could also mean being a missionary proclaiming the Gospel to a third world country, OR even being a missionary proclaiming the Gospel in the day to day jobs here in the Powder River Basin, at the coal mines or in a job here in Gillette. Discipleship means following God first in you life, no matter where you are and no matter what job you have. And we can’t help but respond to God in this way because He heals and loves us first (cf. 1 John 4). And so my friends, I want to encourage you: If you find yourself in Job’s position of thinking you’ll never see happiness again because of your suffering, remember it isn’t the end of your story! Remember that Jesus wants to heal you and He does heal you through His sacrifice on the cross. Know that Jesus is always with you amidst suffering and will always heal your soul when you reach out to him. And the healing that Jesus gives us is accessible to all through His sacraments and in a special way through the Eucharist and the Sacraments of Confession and Anointing of the Sick. Which, in turn, prompt from us a response of gratitude and love, in discipleship. And so, my friends, as we approach the Eucharist today I encourage you to ask Jesus to heal you in whatever area of your life you need it most. And, in gratitude and love, respond to God’s generosity by serving Him in all that you do in every aspect of your life.